What is empathy, and what does it have to do with reading? Empathy is the ability to understand and share the feelings of another. It is the ability to put yourself in someone else’s shoes and see things from their perspective. It connects us to others in a deep, emotional way. There are numerous blog posts and articles on the subject of empathy, how it connects students to each other, and how it impacts a school’s culture. 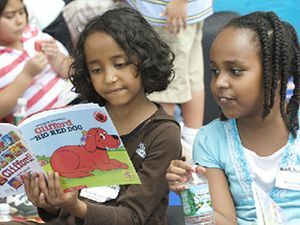 Empathy plays a role in reading by allowing readers to connect with characters and inject themselves into the story as if they are sharing the experience. It takes readers past basic metacognition (thinking about their thinking) and allows them to walk through a story in the characters’ shoes. By explicitly teaching empathy and then connecting it with reading, you have the power to profoundly increase comprehension. The first step in explicitly teaching empathy is to look for common ground. What shared experiences do you or your students have? Model vulnerability and encourage your students to be vulnerable as well. Share your collective fears and experiences and discuss the emotions connected to them. Be deliberate about creating a safe atmosphere for discussing feelings. If this type of sharing is commonplace in your classroom and you have norms about how to share and respond respectfully, vulnerability and empathy become much easier. Walk students through low-risk sharing first, then increase the perceived risk as students develop a sense of shared trust. Next, you can begin discussing behaviors and what emotions may lie behind them. What may be driving a person to behave or respond in a certain way? This type of thinking will encourage students to consider point of view and relate to the emotions of others, which has the additional benefit of assisting with problematic behaviors in class. Once students are able to employ empathy in classroom discussions and interactions, compassionate action is a logical next step. This would be a good time to discuss with students the differences between empathy, compassion, and sympathy. Simply put, empathy is related to understanding the feelings of another, compassion is related to actions based on concern for another, and sympathy is related to feeling “bad” for someone. Many times they are used interchangeably, but are in fact quite different! Practice compassion in your classroom – intentionally and visibly – on a daily basis. Once students are able to act compassionately within the classroom, look for ways to take this skill outside the classroom and utilize it in bigger ways to make your school a better place. Finally, connect empathy to the world – bring in big topics and current events to discuss. Look at examples of how students live and learn in other parts of the world. This pushes empathy into a more global position and enables students to employ their skills in a wider range of scenarios. Several studies* have shown that empathy is increased by reading fiction. Conversely, intentionally developing empathy will, in turn, foster greater engagement with reading and higher levels of comprehension as students are able to connect more deeply with stories. Readers will be able to relate to characters with greater ease, connect and react more often and with greater openness to situations occurring within the story, and develop a much stronger understanding of the motivations and actions of characters. Hold regular class discussions focused on emotional topics and themes within books. Be sure to include talk about how characters and situations impact you as readers. How does that impact affect your point of view or your feelings about the book, characters, or situations? Annotate emotional connections as you read. Teach students to note emotions, reactions, connections, and thoughts in the margins or in a reading notebook as they read. This can be a valuable source of insight. Show students how to construct journal entries about how they empathize with characters or situations in books. What emotions were they able to identify? What, if any, shared experiences do they have? Journal about what you wish you could say to characters in a book. Write them a letter. Hold empathy debriefs following reading, either as a class or with partners or groups. What was your empathy experience like as you read? How did your understandings help you as a reader? Helping students connect empathy to reading will ultimately lead to deeper comprehension of stories, characters, and themes. Metacognitive skills (thinking about your thinking) are a big step toward comprehension. Empathy (thinking about another’s thinking and feelings) is an even bigger step toward deeper comprehension. The combination of the two propels students to even greater success, leading to truly powerful comprehension!